I often read George Boardman’s column in The Union with interest and Jeff Pelline’s critical rants of his writing with some amusement. But, now George has gone over the line into stupid. He writes in his Monday Column: People pick and choose when it comes to the science they want to believe. Then there’s conservatism’s current favorite whipping boy, human-caused climate change. They don’t care what the science says; they know in their hearts that it’s just an excuse to exert more control over our lives. The Third Assessment Report of the International Panel on Climate Change laid out the case for human-caused climate change when it was published in 2001. No major scientific group has challenged its findings; even the American Association of Petroleum Geologists changed its position from opposed to noncommittal. But much like the shills hired by the tobacco companies to challenge the Surgeon General’s report in the ’60s that smoking causes lung cancer and other diseases, the opponents of climate change keep issuing counter claims they can’t support with anything resembling real science. The highlighted text is one of the stupidest statements that Mr Boardman has written in a long time. 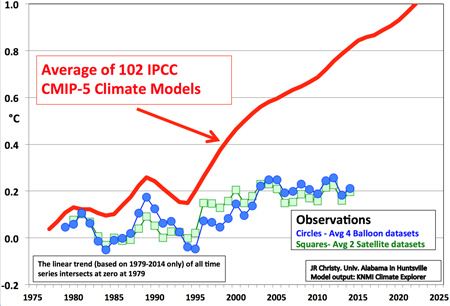 First off the UN IPCC claims were made based on computer models, which are not real science, they are just crude attempts to model the global climate, without including the impact of clouds, while using an inflated assessment of CO2 impact on the climate. Models can be made to report what ever the operator desires by the parameters they choose to enter in the model, or leave out of the model. A new paper published in the Open Journal of Atmospheric and Climate Change by renowned professor of physics and expert on spectroscopy Dr. Hermann Harde finds that climate sensitivity to a doubling of CO2 levels is only about [0.6C], about 7 times less than the IPCC claims, but in line with many other published low estimates of climate sensitivity. The graphic below shows the remarkable disconnect between predicted global warming and the real world. After 35 years the models have been unable to predict global temperatures, nor the current pause in warming that is now over 18 years long. Who are you going to believe dodgy computer models or the facts? George, Real scientist believe in the facts, not computer models. Those pushing the IPCC claims like Boardman is, will not look at the scientific evidence that skeptics produced to contradict the anthropogenic warming hypothesis. 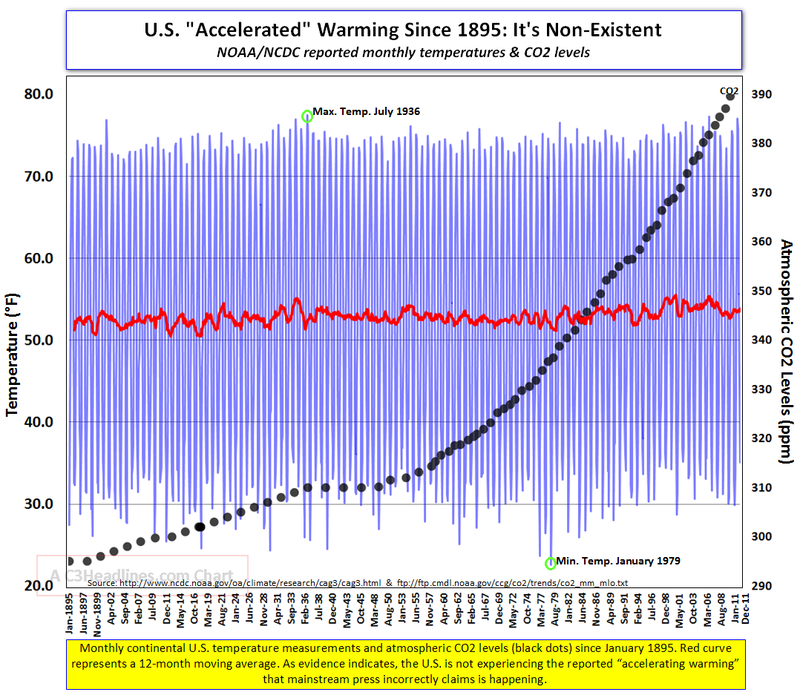 Those pushing the IPCC claims knew the public would not realize the implications of the fact that while CO2 continues to increase, but the temperature didn’t for the last 18 years. I guess that puts George Boardman in the low information public information category, often referred to as the clueless! Update: Please check out the comments on this subject at Rebane’s Rumination at this LINK! This entry was posted in Analysis, Climate Change, Local Media. Bookmark the permalink. It may be important to argue the science but I think the two sides on this topic are arguing past one another. I don’t see people from either side convincing the opposition. If you want to win an argument with someone, start arguing the cost vs. benefit of the climate change solutions with the people who don’t care about the science but do care about how much they pay for energy. California has gasoline prices that run about $1 per gallon more than the average of the US so the drivers of California are out an extra $600 per year. On the utility front, the price of electricity per KW-hr is about 50% greater in CA than the rest of the nation. That’s got to drive utility bills up by at least another $500 per year for many households. Those costs don’t just decrease the amount of money households have to spend, it likely increases costs for employers and put pressure on wages, particularly for blue collar wage earners. If you want to make an impact in this debate, it’s high time to foment class warfare within the Democratic party. Excellent point! People are more concerned about wallet issue, than more difficult to understand climate science. What are the chances Boardman will come to your site, read the info here, understand it enough to debate it? Maybe 1% chance? I posted a comment with link on his Union article. But, I am not sure anyone reads the comments at the Union. I’ll step out and make a bold but also obvious predictions – no leftist will address the information you have presented, they will only continue calling skeptics the dog-whistle names they have been taught by their political betters.